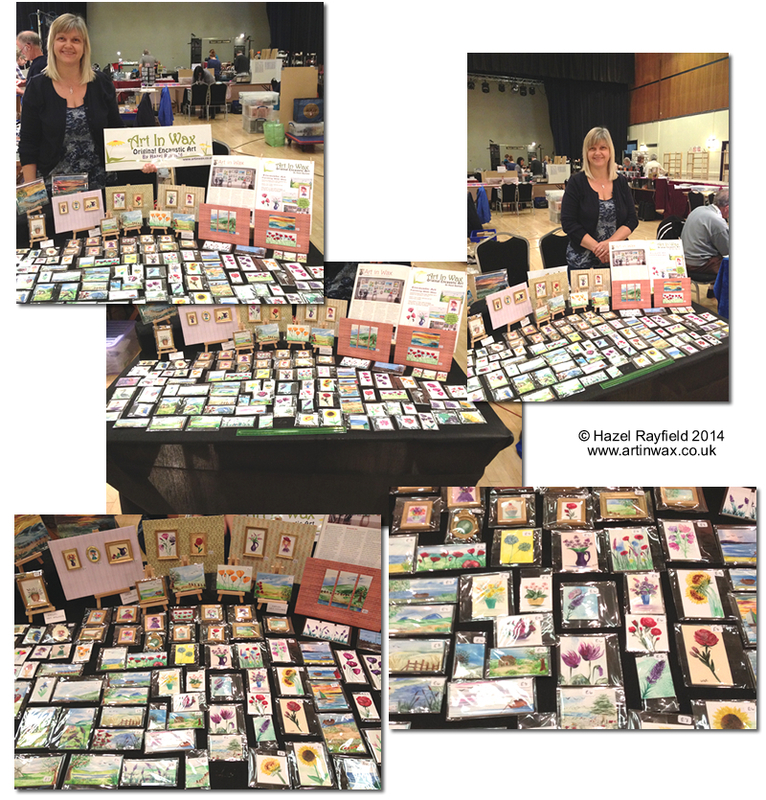 These are the photographs from yesterday 5th October 2014 at our first ever Miniature Fair. The fair was in The Mill Events Center Rayleigh Essex and we had a good day, the fair was well organised by Dollys Daydreams Fairs with lots of stalls and a wide variety of wonderful miniatures, ranging from full houses to buy or built to amazing furniture and thousands of fantastic accessories. Art In Wax miniatures were very well received and it was lovely to see and chat with everyone, lots of people knew who I was to my surprise, many having seen Art In Wax online or in features in Dolls House magazines. It was great to put faces to some of the names from online groups and forums. Adrian and I had a fun day and we sold some Art In Wax too !! and have already seen one of the Triptych pictures we sold, a Poppy Meadow in situ in its new home – the lady who bought it for her miniature scene Tea Shop has send me a photo via Facebook. We will be taking Art In Wax to other fairs in the future but they are available to buy online too, on this website, via Etsy, links below. Buy Miniature Art In Wax from this website : Free UK postage on all paintings direct from the Art In Wax website. Buy Art In Wax via Etsy I ship worldwide. Next Saturday (28th April 2012) sees the launch of a new “Handmade” store opening in Colchester Essex and Art In Wax will be displayed and for sale in this new store. The new store, “Handmade” owned and run by Maryann Morris will be opening in Sir Isaacs Walk Colchester next Saturday and is a store filled with British Artisan-Made gifts and accessories. A selection of Art In Wax original paintings will be on display and for sale together with over 30 other British designer makers ranging from handmade jewellery to accessories, and from art, bath products to candles and luxury gifts and promotes itself as the “One Stop Pamper Shop for handmade luxuries and gifts for all the family”. There will be special offers on the launch day plus prize draws including an Art In Wax painting, so if you are in Essex next weekend why not pop in for a look around. Art in wax paintings are all original, below is photograph of some the the painting which will be for sale in the new Handmade shop, they range in size from 6 x 4 to 8 x 6 paintings and cover some of my favourite subjects, flowers, landscapes and fashion art. As you can see they are wrapped in cellophane and each have a tag with the Art In wax details on, all paintings are original artworks and are signed both in the wax and on the back. If you have seen Art In Wax in store or you are going to be part of this event why not leave me a comment below. I was recently asked if I had any literature about Art In Wax, to which I naturally replied yes its all online on our website. As a web designer for business, Adrian (my husband) and I built this website as a natural progression to display my artwork, however this made me realise that I needed some hard copy literature too. 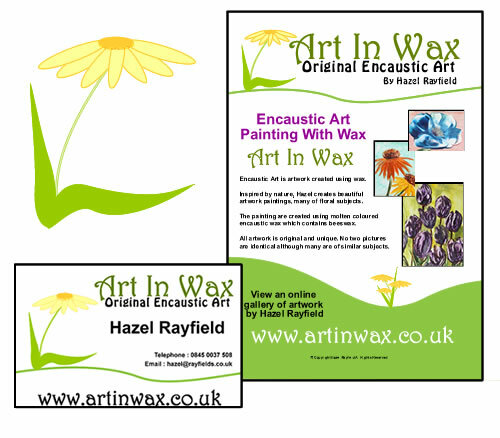 So I set to work this week and have designed a business card and leaflet for Art In Wax, the artwork was send to the printers on Monday and I have just had an email from UPS to say they will be delivered today. Exciting stuff!